This amazing chocolate bouquet is pure luxury. 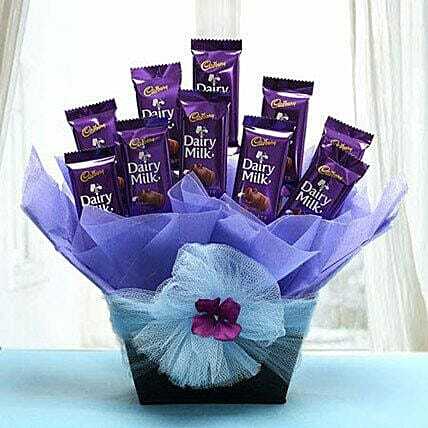 This delicious bouquet is gorgeously arranged with 10 cadbury dairy milk chocolate of 14 grams each. It would make a fantastic birthday gift or anniversary present. Store your chocolates in the refrigerator. If they are exposed to high temperatures, they may begin to soften, compromising the appearance and flavor. Please refer to the expiration date on the package and consume your chocolates before that.